Beginning in the sixteenth century, Protestant missionaries went to China for the gospel, but in the opening years of the twentieth century, following years of faithful labor and prayer, the Lord’s move in China began to advance dramatically after the martyrdom of many Christians in the Boxer Rebellion. In the 1920s, many believers, who were raised up by the Lord from among high-school and college students throughout China, became instrumental in the spread of the gospel. From among these students, Nee Shu-tsu (Watchman Nee) was called and equipped by the Lord for His work. Nee Shu-tsu was exceptionally intelligent. From his entrance into elementary school through his graduation from the Anglican Trinity College in Foochow, he ranked first in his class as well as in his school. With many grand dreams and plans for his future, he could have been a great success in the world. In 1920 at the age of seventeen and after considerable struggle, Nee Shu-tsu was dynamically saved while in high school. At the moment of his salvation, his plans for his future were entirely abandoned. He testified, “From the evening I was saved, I began to live a new life, for the life of the eternal God had entered into me.” Later, when he was called by the Lord to carry out His commission, he adopted the English name Watchman and the Chinese name To-sheng, which means “the sound of a watchman’s rattle,” because he considered himself to be a watchman raised up to sound out a warning call in the dark night. Early in his Christian life, he also received much spiritual edification and perfection from Margaret E. Barber, an Anglican missionary in China. Primarily through his fellowship with her, Watchman Nee realized that being a Christian is altogether a matter of knowing and experiencing God’s divine life in Christ. Through her shepherding, he learned to pay more attention to the operation of the divine life within him than to mere outward work (Phil. 2:13). Watchman Nee received a wealth of revelation from the Word; he truly saw the content of the divine revelation. The core of the revelation he received involved the living of a crucified life and a resurrected life for the church life. 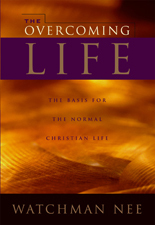 The believers’ experience of the death and resurrection of Christ is the base and touchstone of a normal Christian life, and the issue of living a normal Christian life is the church as the Body of Christ, which has both a universal and a local expression. Watchman Nee realized that we, as believers, have been crucified with Christ and that the normal Christian experience involves Christ living in us through our experience of bearing the cross in our practical human situations (Gal. 2:20). Many of the experiences that informed Watchman Nee’s realization of this truth are presented in his book The Breaking of the Outer Man and the Release of the Spirit. From the very beginning of Watchman Nee’s ministry, the Lord arranged his situations as opportunities for him to deny his soul-life and his natural life in order to experience the resurrection life of Christ. Watchman Nee saw that we, as believers, had not only died with Christ but were also raised with Him (Rom. 6:4-5, 8). Through his experience of the resurrection life of the indwelling Christ, Watchman Nee was able to bear the cross and to participate in the fellowship of His sufferings, being conformed to His death (Phil. 3:10). In the resurrection life of Christ, he was empowered to abandon the world, forsake his future, and deny himself in order to be freed from sin and to overcome Satan. In the resurrection life of Christ, he also served the Lord, worked for Him, and carried out His commission. Watchman Nee’s contemporaries bore witness to the fact that he consistently rejected his natural strength in the Lord’s service. He feared the intrusion of his natural life into the Lord’s work. In delivering messages, contacting people, writing articles, corresponding with the believers, and even in taking care of small matters, he endeavored to live according to the resurrection life of Christ. With such a living as his constitution, he was able to pass through his extended imprisonment and eventual martyrdom. Watchman Nee also saw that the church as the Body of Christ was simply the enlargement, expansion, and expression of the resurrected Christ. His vision of the church as the Body of Christ in resurrection was far advanced. His ministry concerning the crucified and resurrected Christ was a stewardship of grace that ministered the resurrected Christ into the believers for the building up of His Body. He saw both the universal aspect of the Body, which is detailed in the book The Glorious Church, and the local expression of the Body, which is presented in the books The Assembly Life, The Normal Christian Church Life, and Further Talks on the Church Life. The divine revelation that Watchman Nee saw resulted in a twofold burden and commission from the Lord: First, to bear the testimony of the Lord Jesus and, second, to establish local churches. The first burden and commission arose from his personal depth of knowledge and experience of Christ’s all-inclusive death and resurrection. The Lord specifically burdened and commissioned him to bear testimony to this truth. He faithfully responded to this burden by releasing numerous spoken and written messages on the subjective aspect of the Lord’s crucifixion and resurrection, on the principles of the divine life, on the supremacy of Christ, and on God’s eternal purpose. These messages are contained in books such as The Overcoming Life, God’s Overcomers, The Spiritual Man, and God’s Eternal Plan. When the Lord called me to serve Him, the prime object was not for me to hold revival meetings so that people might hear more scriptural doctrines, nor for me to become a great evangelist. The Lord revealed to me that He wanted to build up local churches in other localities to manifest Himself, to bear testimony of unity on the ground of locality so that each saint might perform his duty in the church and live the church life. God wants not merely individual pursuit of victory or spirituality, but a corporate, glorious church presented to Himself. Watchman Nee saw an undeniable vision and received a definite commission from the Lord concerning the church, and he suffered greatly due to his faithfulness, including rejection, opposition, and condemnation. Nevertheless, he was willing to pay the price for following the Lord, even to the point of the cost of his life. His profound revelation combined with his sufferings issued in a rich ministry of life. Watchman Nee endured much suffering for the sake of the New Testament ministry. Due to his absoluteness in following the Lord and his faithfulness in fulfilling the Lord’s commission, he underwent frequent mistreatment as well as lifelong hardships. As he fought the battle for the Lord’s move, he was under constant attack from God’s enemy, Satan. At the same time, he was also under God’s sovereign hand. He recognized the sovereign arrangements of God in his environment not merely as a divinely apportioned “thorn in the flesh” but, more importantly, as a means by which God was able to deal with him. Due to both Satan’s attacks and God’s faithful environmental dealings, Watchman Nee lived a life of suffering. The majority of his sufferings came from five sources: poverty, ill health, denominational opposition, dissenting brothers and sisters in the local churches, and imprisonment. In the early years of Watchman Nee’s ministry, the economic situation in China was desperate. Nevertheless, he lived purely and singly by faith in God, not only for his living but also for every aspect of the Lord’s work. Hence, he steadfastly refused employment from any person or organization. In the early days of his ministry in Shanghai, there were times when he had only a little bread to eat for the day. Watchman Nee was also frequently afflicted with serious illnesses. For the first eleven years of his ministry, beginning in 1922, he suffered alone, with no wife to support him. During this time he contracted and suffered from tuberculosis for several years. In 1934 at the age of thirty, however, Watchman Nee married a true “help meet,” Charity Chang. In later years he was also stricken with a chronic stomach disorder as well as angina pectoris, a serious heart ailment. He was never cured of the heart disease; thus, his ministry was sustained by the resurrection life, not by his physical strength. A number of brothers and sisters meeting with the local churches became another source of suffering to Watchman Nee through their dissention, immaturity, and ambition. Two years after the church life began to be practiced in Watchman Nee’s hometown in 1922, he was even temporarily “excommunicated” by some of his co-workers because he protested the ordination of some leading co-workers by a denominational missionary. Although most of the believers meeting with them sided with Watchman Nee, the Lord would not allow him to do anything to vindicate himself. That was a deep suffering to his natural man. Watchman Nee was a man of sorrows and suffering. Throughout his entire history of following the Lamb, he suffered much. Through these sufferings, however, he learned many lessons in regard to trusting the Lord; his sufferings also benefited him by dealing with his flesh, his self, his soul, and his natural life. Due to his obedience to these dealings, he did more than convey mere teachings and doctrines; his messages contained the reality that he acquired through his sufferings. The experience he gained through his suffering served as an immeasurable help to all those under his ministry and also became a rich heritage to the Body of Christ, a heritage acquired by paying a price, even the ultimate price. Watchman Nee’s sufferings also enabled him to receive further revelation from the Lord through the Scriptures. Watchman Nee was purified, dealt with, broken, and constituted by the Holy Spirit with the divine life through his sufferings. Through such experiences of Christ within his sufferings, he, like Paul, was prepared and positioned to receive the Lord’s revelation. Watchman Nee’s rich ministry was the issue of both revelation and suffering. He carried out this ministry by preaching the gospel, teaching the Bible, traveling, contacting people, corresponding with people, holding conferences, conducting trainings, and producing publications. Watchman Nee not only spoke frequently both privately and publicly, but he was also a prolific writer. His publications included gospel tracts, periodicals, papers, newsletters, books, hymnals, and a chart of biblical prophecies. His writings are contained in a set of sixty-two volumes, entitled The Collected Works of Watchman Nee, which span from his first publication in 1922 to his final recorded speaking in 1950. Watchman Nee served the Lord together with others, including Witness Lee, his close co-worker. Witness Lee was raised as a Southern Baptist and was saved in 1925 at the age of nineteen. In his seeking to know the Bible, Witness Lee came to regard Watchman Nee’s articles and publications as being the most accurate in presenting the truth contained in the Bible. When he began to correspond with Watchman Nee, he was surprised to learn that someone only two years older than himself was such a mature Christian. In 1932 Witness Lee invited Watchman Nee to Chefoo, and the two had their first personal contact. During the time they spent together, Watchman Nee’s stress on the experience of divine life rather than on mere knowledge of the Bible caused Witness Lee’s fellowship with the Lord to deepen and to grow more intimate. In the same year believers began meeting in Witness Lee’s home, and by the following year this meeting was thriving. Due to the needs of the church, both men believed that the Lord desired Witness Lee to serve Him full time, and when Watchman Nee urged him to serve the Lord full time, Witness Lee regarded his word as the confirmation of the Lord’s leading and began to serve with Watchman Nee, under his perfecting and fellowship. Watchman Nee perfected and tested Witness Lee, preparing him to bear more responsibility. Realizing that the Lord’s work in China, which began in Shanghai through Watchman Nee, must be one, Witness Lee gave up his work in northern China and moved to Shanghai in 1934 to work more closely with Watchman Nee. They labored, suffered, spread the work, received revelation, and brought in revivals together. Brother Lee edited Watchman Nee’s publication The Christian from 1934 to 1940, serving in the Shanghai Gospel Bookroom set up by Watchman Nee, and was Watchman Nee’s best man at his wedding. Watchman Nee was arrested in March 1952 because of his professed faith in Christ as well as his leadership among the local churches. He was falsely condemned, judged, and sentenced in 1956 to fifteen years of imprisonment. During this time, only his wife was allowed to visit him. Although there is no way for us to know what he experienced of the Lord during his long imprisonment, his last eight letters provide a glimpse into his suffering, feeling, and expectation during his confinement. Although prison censors did not allow him to mention the Lord’s name in his letters, in his final letter, written on the day of his death, he alluded to his joy in the Lord: “In my sickness, I still remain joyful at heart.” Watchman Nee was practicing the word of the apostle Paul, who said in Philippians 4:4, “Rejoice in the Lord always.” He died in confinement on May 30, 1972. Humanly speaking, he died in misery and humiliation. Not one relative or brother or sister in the Lord was with him. There was no proper notification of his death and no funeral. He was cremated on June 1, 1972. Because his wife had died six months earlier, her eldest sister was informed of his death and cremation. She retrieved his ashes, which were buried alongside those of his wife in his hometown of Kwanchao in the county of Haining, Chekiang province. In May 1989 the ashes of Watchman Nee and his wife were transferred to and buried in “The Christian Cemetery” in Shiangshan in the city of Soochow, Kiangsu province. During Watchman Nee’s imprisonment he was confined, but his ministry was not bound (2 Tim. 2:9). Under the Lord’s sovereignty, his ministry has spread throughout the entire world as a rich supply of life to all seeking Christians. His ultimate burden was the spread and the building up of the church as the house of God, God’s tabernacle. Although his own earthly tabernacle (physical body) has been taken down, the building of God obtained through his ministry remains and still is growing and spreading throughout the earth. By the time Watchman Nee was arrested in 1952, approximately four hundred local churches had been raised up in China. In addition, over thirty local churches had been raised up in the Philippines, Singapore, Malaysia, Thailand, and Indonesia. Today there are over twenty-three hundred local churches worldwide because of the rich and faithful ministry of Watchman Nee.